Another Western-style plaid shirt, this time with pockets that do up with two snaps. The plaid on the pockets and shoulders runs on a diagonal and the entire shirt does up with snaps. It’s a deep purple and a light brown and white plaid. Sam wears this shirt at the very end of The Kids Are Alright (3x02), when we see him confirm over the phone that everyone who knew his mom is now dead, and then find out that Ruby is a demon. 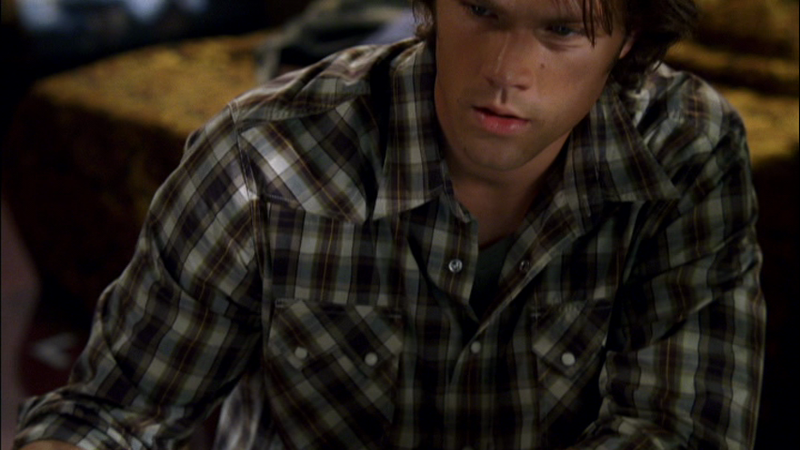 In Hammer of the Gods (5x18), Sam wears this shirt for the entire episode. 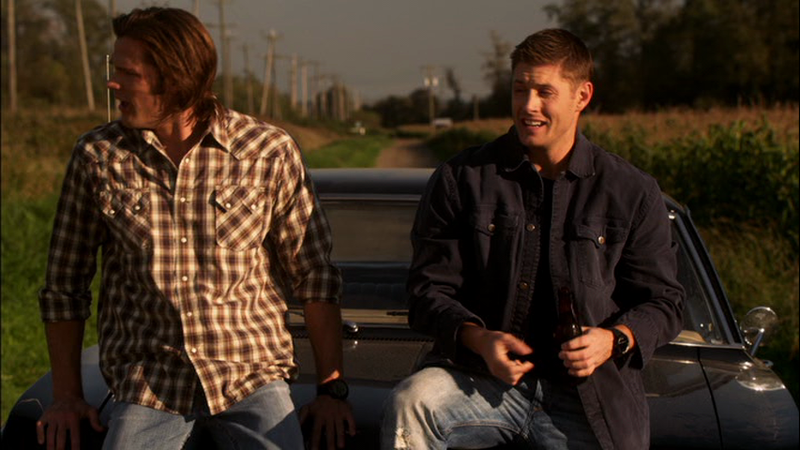 In Clap Hands If You Believe (6x09), Sam wears this shirt at the very end of the episode when he and Dean are sitting on the hood of the Impala. In The Man Who Knew Too Much (6x22), Sam wears this shirt for the entire episode, both in the real world, and in his dreams. In The Girl with the Dungeons and Dragons Tattoo (7x20), Sam wears this shirt from the beginning of the episode until they take Charlie to the hospital. In Torn and Frayed (8x10), Sam wears this shirt at the end of the episode, when he and Dean discuss Cas, and Sam decides to stay with Dean. In Pac-Man Fever (8x20), Sam wears this shirt at the end of the episode when saying goodbye to Charlie and then getting hugged by his brother. In Slumber Party (9x04), Sam wears this shirt from the beginning of the episode until the Wicked Witch is defeated. In The Purge (9x13), Sam wears this shirt at the beginning of the episode when he talks with Dean in the bunker and Dean finds the case. 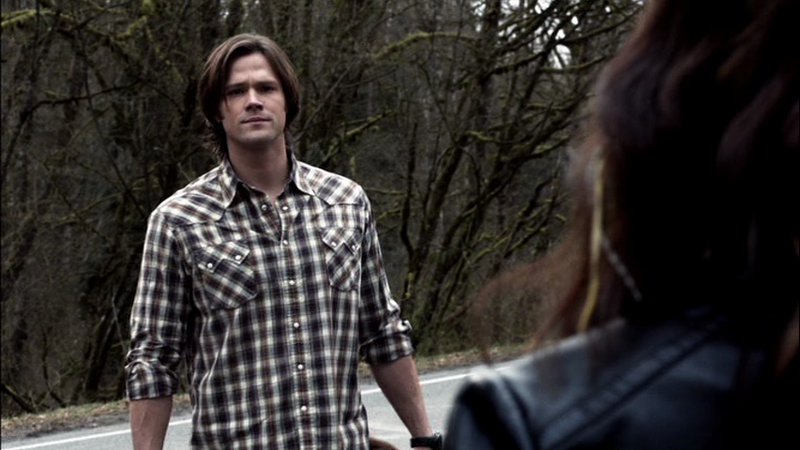 In Black (10x01), Sam is wearing this shirt when he goes into Dean’s room and re-reads the note that Dean left behind. He keeps it on until he finds the possible lead and leaves the Bunker. In Paint It Black (10x16), Sam wears this shirt when he and Dean are actively trying to kill the ghost at the end of the episode. In Dark Dynasty (10x21), Sam wears this shirt from the beginning of the episode until they get back from Omaha, except when he and Dean briefly wear suits to interview the building manager in Omaha. In Just My Imagination (11x08), Sam wears this shirt once he and Dean leave the Bunker to go help Sully. He takes it off only briefly when wearing a cardigan in order to pose as a child trauma counsellor to see Sparkle’s body. In Safe House (11x16), Sam wears this shirt when he and Dean are researching the history of the house and Bobby’s old journals at the motel and when they go to dig up the graves and find out that Bobby and Rufus already burned both sets of bones. In The Raid (12x14), Sam is wearing this shirt when we pick up with Sam and Dean after Mary leaves – he wears it for the rest of the episode.